TULSA, Okla., April 6, 2017 /PRNewswire/ -- The Center for Individuals with Physical Challenges has announced plans to expand its facility to offer more services to more individuals with physical disabilities. The Center is the only known facility in the nation providing multiple services like fitness, recreation and community reintegration to the disabled community. Music video featuring Center Members. Rendering by KKT Architects of the new Hardesty Adaptive Sport Complex. View is of corner of 11th and Utica in Tulsa, OK. The two-story expansion, named The Hardesty Family Adaptive Sports Complex, will be a 28,000 square foot facility featuring an NCAA regulation basketball court, an adaptive rock climbing wall, resistance therapy pool and elevated walking track. Universal design concepts integrated into the current facility will be applied to the expansion, removing accessibility barriers many with physical disabilities face in standard structures. For more information on the project, visit www.tulsacenter.org/DreamBig. Also in the plans are updates to their current green space to include an outdoor sports court, a water feature named in memory of well-known Tulsa disability advocate Nate Waters and a butterfly garden. Plenty of walking/cycling trail will remain with benches and shade sails along the path. Nearly 56.7 million, or 1 in 5, Americans have a disability. Evidence shows that regular physical activity provides them with important health benefits including improved cardiovascular and muscle fitness, improved mental health, and better ability to do tasks of daily life. The Center served nearly 1,500 people last year and since moving into its current facility in 2005, the agency has seen a 60 percent growth in membership. 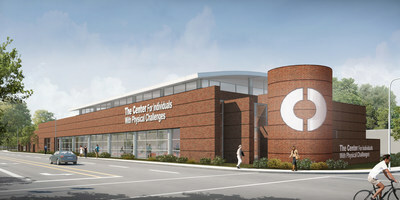 This expansion project will allow The Center to continue to increase membership, offer more programs to youth with physical disabilities and host adaptive sport competitions. Construction of the addition is set for June 2017 and should be complete within a year. The addition is designed by KKT Architects and construction will be done by Oakridge Builders. The Center has raised $10.7 million of their $12 million expansion goal. For more information on the project, visit www.tulsacenter.org/DreamBig.